The final Best of 2013 post, this one is themed around today's special date. New Year's Eve. Gone are the days when plans are made for all night parties and nights on the town, I'm old; even a quick tipple down the local is a bit too much for me - I'll take a Buffy marathon and tea over a hangover any day. So instead of spending the last night of 2013 binge drinking, I'm going to stay in and pamper. You know that feeling of getting into bed when there's fresh, clean bedding? It always feels better. I take any excuse I can get to pamper as often as possible and my body care stash is a little bit crazy. But there's a few products which stand out, from high-street to high-end, and their products I see staying at the heart of my body care routine for a long time to come. Lush Fair Trade Foot Lotion (Lush, 225g, £9.25): This isn't a product I ever envisaged having a spot in my top body care products of the year, but it definitely deserves its place. With Peppermint and Spearmint, which work to stimulate circulation, blood flow and give a cooled effect, and Arnica which helps with bruising and swelling, whilst Cocoa Butter and Almond Oil work to soften and hydrate the skin. It has a pleasant scent, not my favourite but it'll do, and it doesn't feel too heavy on the skin, sinks in easily and lasts forever. I've hardly dented the tub and I've been using it most nights for a long time! Burt's Bees Lemon Butter Cuticle Creme (Boots, 17g, £5.99): A favourite for many years, and probably many years to come. I've mentioned this product so many times, so I'll keep it brief. With Lemon Oil, both beneficial to the skin and also an incredible soft, the Burt's Bees Lemon Butter Cuticle Creme is a buttery soft yellow balm like product, which makes looking after cuticles, elbows and knees effortless! Another product that really does last forever, and the scent never weakens; it always smells absolutely mouth watering. Love this, it's an essential, one of those products I'll share with the grandchildren in years to come! Antipodes Joyful Hand & Body Cream (Selfridges, 120ml, £29): I'm still holding out hope that Antipodes bring the stunning scent of Joyful into a perfume, it's delicious. The gorgeous scent of Joyful is all down to the formula and lovely list of ingredients. With nutrient-rich Avocado Oil, fantastic for boosting hydration levels to dry, tired and stressed skin. Then there's the premium bio-active ingredients, which include our fab Avocado Oil, as well as Wild Blackcurrant and Hibiscus Flower. On the skin it feels light, velvety soft and sinks in fairly quickly ensuring no residue product is left behind. Not my everyday reached for hand cream, but a firm favourite which is always beside my bed for a before-bedtime pamper. Aromatherapy Associates Revive Morning Bath & Shower Oil (Space NK, 55ml, £39): Aromatherapy Associates, easily one of my most raved about and mentioned brands of the year, I think. My favourite of all products is the Revive Morning Bath & Shower Oil, which is the perfect refreshing scent to revive you in the mornings. Aromatherapy Associates use incredibly high quality ingredients, some of the finest ingredients you'll find in aromatherapy oils, to create really stunning products which are not only worth the price tag, but worth every last rave review, too. I couldn't be without my Revive Morning, especially in the colder winter months. Bodhi Rosemary Chi Himalayan Detox Salt Scrub (Samsara Skin, 250g, £35): The Goddess of Body Scrubs is the phrase I used to describe this sensuous body scrub when I reviewed it back in July, and that definitely still stands. A true pamper product, nothing makes me feel more luxurious than when I use this scrub. Leaving my skin effortlessly smoother and softer to the touch, this pink salt scrub uses Himalayan Salt Crystals and reviving Essential Oils to create a nourishing, skin-smoothing, butter soft scrub. Incredible. What body care products stand out for you in 2013? I adore Sigma, and I adore blushes. So this review comprises of a perfect combination, showcasing the new Enlight Blush Collection available from Sigma. The Enlight Collection from Sigma actually includes a whole host of beautiful makeup products which can be bought individually, or as one huge set (see here - wowza!) and the collection includes powder blushes, cream shadow bases, an eyeshadow palette, lip liners and lipglosses as well as brushes. The Enlight Warm Neutrals eyeshadow palette (BeautyChamber, £29.95) in particular looks beautiful. But today I am going to talk you through the three blushes from the collection, all of which are new blush shades and also part of the Sigma Individual Blush Collection. Sigma Enlight Blushes in Peaceful, Serene, Mellow* (BeautyChamber*, £9.50 each): There are three shades in the Enlight collection, Serene, Peaceful and Mellow. Each has a lovely, velvety soft powder formula and sits nicely in simple yet stand out Sigma packaging. Peaceful is very pretty, but I'll be honest and say for me, this doesn't tick the 'blush' box. A very pale champagne shade, this actually makes a perfect highlight. It has a shimmer finish, so a bit too much if used as a blush, but as a highlight for your cheek bones, brow bone and inner corner, it's perfect. Serene is where the Enlight Blushes really start to fit the bill, with an absolutely stunning matte floral pink that's warm, like a dusty rose. This is just perfect for this time of year and has a beautiful finish. Serene is my favourite of the three, I just think it would look so incredibly flattering on a variety of skin tones and gives that perfect wind-bitten rosy glow. Lovely. The final shade in the Enlight Blush Collection is Mellow. Mellow is, for me, one of those shades that I think everyone needs in their collection. Described by Sigma as a matte, desert sand, I think this is just a beautiful warm taupe that can be used as a blush, or doubled up as a multi-purpose product to contour. It's just that wonderful in-between shade that can be used to define and create a really natural, yet stand-out look. Overall I'm super impressed with Mellow and Serene, and I do love Peaceful but I just think it's not really a blush. Sigma makeup never disappoints me, their products are always of fantastic quality and well worth a dabble. If you're looking to add some new blushes to your collection, give Serene and Mellow a go. I promise you won't be disappointed! *This post contains a PR sample - all opinions are my own and genuine. For more information, please check my full disclaimer. So far we've covered skincare and hair care, but now it's time to delve into makeup - the products most of us love the most. Oh beautiful makeup, I don't think I'll ever lose my love for makeup, and I doubt my collection will ever be a 'capsule collection', because I seem a little bit incapable of resisting the urge to buy. Makeup is rather wonderful though. For me, makeup works to completely transform my face, it adds definition, working to highlight my best features and discreetly disguise the worst. For me makeup is a confidence booster, a necessity to make me feel like 'me'. Sometimes a mine field, navigating between brands, product claims and prices can be a tricky task, but once you find some firm favourites, it's hard for other products to get a look in. Of all the makeup I have tried in 2013, these are the products which stood out the most for me. Bobbi Brown Long-Wear Even Finish Foundation SPF15 (Bobbi Brown, 30ml, £30): I have raved about this foundation many times. I adore every aspect; from the glass bottle and perfect pump, to the consistency, fragrance, colour match, how it feels on the skin. The formula is perfect, with a light, gel consistency, that feels plump and smooth on the skin. It contains skin-loving ingredients such as Shea Butter, working to moisturise and hydrate the skin. The colour is exceptional, the closest match I have ever found to my true skin tone; the result is a flawless, natural finish. Nothing compares, really. I'm about to repurchase - but so far one 30ml bottle has lasted me nine months. I don't use this everyday; it's too special for that, but it's always my first choice when I fancy something more special. The incredible longevity also makes this the only foundation I reach for when I need my makeup to last all day, it holds up to my oily skin and keeps my skin hydrated at the same time. It's amazing. Clarins Splendours Bronzer (Debenhams, 20g, £30): I've always declared myself as a bronzer addict. Yet recently I've realised I've hardly any bronzers in my collection at all, having used up old bronzers, choosing not to replace them. For me bronzer is one of those products which you can either get right, or very wrong, and from experience of trying several dozens of high-street bronzers against a handful of high-end bronzers, that high-end really does do it best. The beauty of the Limited Edition Clarins Splendours Bronzer, is that it takes that high-end quality, the fabulous pigmentation, the incredibly longevity, and adds the most perfect formula, making application effortless. The colour is just right, with enough of a natural colour but a bit of oomph and natural holiday glow. Part of a limited edition collection in early 2013, this bronzer is no longer widely available, but I've seen it crop up a few times - so keep an eye out! Lancome Hypnose Drama Mascara (Boots, £22): I wasn't sure whether to include this, because I have only used a sample size and I am yet to buy the full size. But I will. I actually adore this mascara and I think it's beaten my current fave, the Bobbi Brown Extreme Party Mascara. Lancome mascaras contain rose in their ingredients, giving each a deliciously sweet floral fragrance. This also works to hydrate the lashes and keeps the formula on the right set of moist. I really struggle with mascaras that are too dry or too light. This has the perfect consistency yet still gives my lashes masses of volume and length. I can't wait to upgrade to the full size, so smitten with this one and it had to be featured in my favourites, as it has been for most of the year! Collection Lasting Perfection Concealer (Boots, £4.19): Everyone and their nan has heard about this, so I'll keep it short and sweet. Thankfully I very rarely suffer from spots or blemishes, so my concealers are very rarely used for that purpose. Generally I use concealers to perfect and brighten my under eye area. The consistency of this particular concealer, is perfect; think but not so thick you can't blend it in, but moist enough to be manipulated and applied in even the trickiest of areas. It can be prone to creasing, sometimes, but generally it ticks all the boxes. It hides dark eyes, holds well, doesn't cake and rarely creases. The shade selection is a bit lackluster, but I switch between Fair, Light and Medium depending on time of year. NARS Light Reflecting Setting Powder (Selfridges, £25): I've mentioned this in passing, yet never credited it with a full review. Which is ridiculous considering it's the perfect setting powder. It's not so much perfect in the sense of an everyday powder, but for those occasions when you really can't afford for your makeup to budge? This is your answer. It's incredible. Completely translucent and incredibly light-weight, this is a super fine powder that needs the slightest amount of product to cover the t-zone and under eye. It's incredible how effortlessly this makes my makeup hold. A prized possession in my makeup collection and worth every last penny. bareMinerals is a brand I have always been curious about, but never really known whether it was worth a dabble or not. I've heard a lot of mixed reviews over bareMinerals products; some are hailed as holy grails, some not so much. I've also strayed away from trying bareMinerals face products in the past because of the ingredients (mineral oil) But I recently got completely sucked in to what looked like a beautiful set of bareMinerals lipsticks that I decided to give a go, as let's face it, I'm a sucker for pretty lip products. Yesterday I shared my favourite skincare products of the year, now it's time to share the stand out hair care products of 2013! This year my hair care curiosity calmed down for a while, and I didn't try many new products; sticking to firm favourites and products that deliver. But there's a few new roducts which now feature regularly in my hair care routine, and they deserved an end of year mention! VO5 Plump it Up Amplifying Blow Dry Lotion (Superdrug, 200ml, £3.69): The only budget-friendly product in my picks, but one which actually beats a high-end product of the same kind, hands down. The VO5 Plump it Up Amplifying Blow Dry Lotion is easily comparable to the Bumble and Bumble Thickening Hairspray, which is a real favourite. But I actually find the VO5 offering to be lighter in consistency which is kinder to my fine, limp hair and holds the root boosting effect for longer. VO5 in general is a really fantastic brand for hair care, specifically their Plump it Up range. Ojon Rare Blend Oil (Ojon, 45ml, £30): The product everyone raved about, the product I was determined was not going to live up to the hype. It was no surprise when I tried this coveted oil myself, that I understand why everyone loves this hair oil and proclaims it is the best there is. Created with incredible ingredients from some of the most remote, natural areas of the world, natural oils are selected for their ability to heal, strengthen and protect the hair. Not necessarily a product I use everyday, as I find once every few days a couple of drops massaged into my mid-lengths to ends, is enough to keep my hair happy for a few days. It's such a wonderful product, a beautiful oil that leaves my hair unbelievably soft, looking and feeling healthy. It also smells amazing and looks fun too! A smidgen of product is enough; I use mine at least once a week and have for most of the year, yet it still looks full! Ojon Volume Advance Volumizing Shampoo (Ojon, 250ml, £18.50) and Volume Advance Volumizing Conditioner (Ojon, 250ml, £20.50): I'll be honest, it actually pains me that my favourite shampoo and conditioner duo happen to cost almost £40 to repurchase, because that is a lot of money. But nothing comes close to how the Ojon Volume Advance range makes my hair feel. The most gentle yet effective shampoo I have ever used, it's perfect for my fine hair and doesn't damage my hair nor strip it of essential natural oils. It also easily adds a bit of oomph to my root area, which is much needed. The conditioner works as the perfect partner to the shampoo and takes that roof lift and does something magical, almost a natural, airy volume that I could only lust of having naturally. My hair always feels perfect when I've used this duo, so although I couldn't repurchase them frequently enough to be my regular choices, I will definitely repurchase again. Macadamia Natural Oil Control Hairspray (Beautybay, 100ml, £5.95): Hairspray has never been a constant product in my hair care routine. Only once trying the Macadamia Natural Oil Control Hairspray, did I see how beneficial a hairspray can be in my routine. The difference between Control and other hairsprays, is that control is infused with Glycerin, Anti-Ageing Aminoethyl Propanol and Soy Proteins, which allow an almost invisible, fine consistency that sprays evenly and just the right amount. It does of course, contain Macadamia Natural Oil, which means this medium-hold hairspray doubles up as a pampering treat for your hair. I also love that this doesn't leave a firm, hard feel to my hair, nor does it feel ill-textured or oily after a few hours wear; this will last you all day, and with a quick touch up, all night too. What are your top hair care products of 2013? After four months of #MyLittleSkincareProject posts, the project has finally drawn to a close. The final project post concentrates on normal skin, with my normal skin bloggers Rosie, Vanessa and Sophie reviewing products aimed at normal skin and specific skin woes. The part of the project I have enjoyed the most are these weekly product reviews - it's all well and good a brand suggesting their products as perfect for your skin, but how can you be sure? I've found the product reviews from each of my bloggers in the project, who have really put each and every product to the test, so helpful. So let's stop rambling and get straight into the final reviews, shall we? 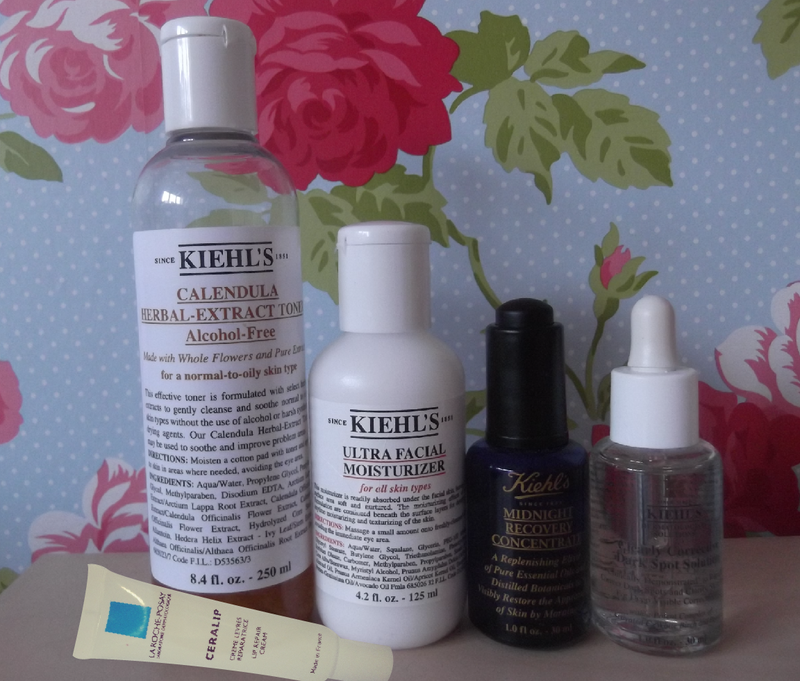 "Kiehl's Powerful Strength Line Reducing Concentrate* (Kiehl's*, 50ml, £49): This is one of what I would describe as Kiehl's 'cult products' - products with big claims that many say live up to their hype. It has many devotees, who say that it reduces fine lines and brightens the skin. Having browsed reviews prior to being sent the product to try I did notice that a few people said that it causes them to break out so it might be worth getting a sample before buying it if you are considering picking one up. Personally I really like it - it made my skin feel more supple and brightened, and I love the smooth texture. I used it morning and night and it was perfect for putting on before make-up as it creates such a smooth, satin finish. Kiehl's Ultra Facial Cream* (Kiehl's*, 50ml, £24): I started using this before the other products so that I could see how moisturised my skin felt after using this without using the other treatments and serums. It is a nice, light, creamy moisturiser that absorbs quickly and isn't greasy or oily. I did find that it left my skin feeling moisturised throughout the day but it didn't blow me away - I enjoyed using it but I probably wouldn't re-buy it. Kiehl's Creamy Eye Treatment with Avocado* (Kiehl's*, 14ml, £20): I was a bit nervous of using this as I get a bit of oiliness under my eyes and other eye treatments have sometimes made this worse. I was slightly reassured by the fact that it had quite a creamy, rich texture and didn't feel greasy. When I apply it initially it sort of glides on but then feels like it melts into the skin and the skin feels tightened. I haven't seen any noticeable results yet but I'm looking forward to continuing to use it and seeing if this could be the wonder product I've been searching for to sort out my dark circles and uneven skin tone under my eyes. Kiehl's Midnight Recovery Concentrate* (Kiehl's*, 30ml, £36): Another Kiehl's cult product, another product that people are often nervous about splashing out on because of the price, but one that they definitely should! I must admit that I was so excited to try this as I'd heard so many people rave about it and say that it's the one product that they religiously use. One of the great things about this product is that you only need a very small amount (two drops) to cover your face and see results in the morning. You put it on before bed and it smells lovely. I did find that after using it my skin felt smoother, and more supple and moisturised in the morning. I will definitely be buying this again but I think it's going to last a long time before it needs re-purchasing! Vichy Idealia Life Serum Skin Idealizer Serum* (Boots*, 30ml, £29.50): I'd not actually tried any Vichy products before I trialed this serum so I was really intrigued to see what it was like. It has a light texture and can be used either on its own or with your daily moisturiser. Again I found it a great product to use before putting on make-up (instead of using primer) as it makes your skin feel smooth and fresh and you can apply foundation straight away without getting that horrible peel-y effect you sometimes do from other serums and primers. Although it hasn't blown me away I have enjoyed using it - it smells lovely and I can definitely notice how much more moisturised my skin feels immediately after using it, I'm just not sure I've noticed any long term effects." "Vichy Liftactiv Serum 10* (Boots*, 30ml, £29.50): This anti-ageing serum, contains hyaluronic acids which seems to be the product de jour. I've been using this every other morning before my day cream. It has a really light texture and has left my skin feeling hydrated and plumped. As for it’s anti-ageing properties, I always find it hard to judge. I’m 26 and my skin is looking fairly youthful still (at least I think so!) This is really great for adding moisture to the skin, so particularly great for normal and dry skins. La Roche-Posay Pigment Control* (Boots*, 30ml, £29): I have some pigmentation on my arm, so I decided to use this there rather than on my face. It made a noticeable difference! The speckling is much less noticeable than it was before I started using. It’s a great product, but I found I needed to moisturise the area more often as it was a little drying on the skin. Great for hyper-pigmentation or lentigo. Kiehl's Powerful Strength Line Reducing Concentrate* (Kiehl's*, 50ml, £49): I love, love, loved this. It’s so lightweight you can barely feel it and it sinks in within seconds. It’s very matte, so doesn't leave skin looking dewy or shiny. It helps to even out the skins surface - I do have a couple of fine lines on my forehead, and they seemed to disappear when using this. Again, I used it alternate mornings under my day cream. Kiehl's Midnight Recovery Concentrate* (Kiehl's*, 30ml, £36): Another great product from Kiehl’s. I’m a big fan of using face oils at night to help lock in moisture, and this is up there with the best of them. It smells divine, very spa like and relaxing. It melts into the skin and works its magic overnight, leaving skin looking refreshed by morning. Great for normal skin, but I think it would be ideal on any skin, even oily. This is sure to be a firm favourite from now on and I can’t imagine not having it in my routine now. Kiehl’s Rosa Arctica lightweight Cream* (Kiehl's*, 50g, £45): This wasn't quite as lightweight as I was expecting given the name, it’s quite a thick cream that does take it’s time to absorb. Nonetheless, it was a very nice base for cream makeup. This contains a rare flower, the “Haberlea Rhodopensis”, also known as the “Resurrection Flower” which is known to increase skin cell vitality. It does leave skin looking hydrated and plumped, and I think it’s a great product for those with normal skin." "La Roche Posay CeraLip* (Boots*, 15ml, £7): It's not often I really don't like a product, but this is one of them. I want a lip treatment to last on my lips and feel like it's doing its job, but I found neither of these - as soon as I applied it, I felt like I was wanting to put more on again as it just seemed to instantly disappear. I felt like it wasn't really doing anything for my lips because I had to reapply so often - I'll be glad to go back to my trusty Carmex. Kiehl's Calendula Herbal Extract Toner* (Kiehl's*, 250ml, £34.50): The girly part of me loves the little leaves and flowers floating in this - it seems too pretty to put on your skin! I never usually use a toner in my routine purely from never seeing one have a significant effect on my skin. I've been using this for well over a month now, and it still feels like a step of my routine I could skip. The good thing is a little goes a long way - this has barely gone down since I started using it, and I do look forward to seeing if I feel like this has made a difference once the bottle is finished. Kiehl's Ultra Facial Moisturiser* (Kiehl's*, 75ml, £17): This is one of the few products from this project where I feel I've noticed a difference. My skin generally does feel a lot more hydrated and moisturised, compared to when I was using my usual Simple one. I've had a hefty cold for a few weeks now and would usually be suffering from awful dry skin around my nose, but I've had none of this since using the Kiehl's moisturiser! Kiehl's Midnight Recovery Concentrate* (Kiehl's*, 30ml, £36): I have fallen in love with this product - the smell alone smells like it's going to be doing my skin some good! My skin feels refreshed when I wake up in the mornings, and I have even noticed a reduction in the fine lines around my eyes. Again, a little bit goes a long way, and I am very fortunate to have found this product. Kiehl's Clearly Corrective Dark Spot Solution* (Kiehl's*, 30ml, £36): Unfortunately (or fortunately, maybe? ), I have no use for this product. I have no dark spots, uneven skin-tone or pigmentation to test it out on to see if it makes a difference. The only time I could maybe think to use it is to get rid of the little red patch left behind from spots, but I already have products I love which do this job for me!" Thank you Rosie, Vanessa and Sophie for the final product reviews for normal skin - and to all of the girls for each skin type, for making this project a wonderful project to work on. *This post contains views from other bloggers, on PR samples. These views are there own, and separate to me. For more information, please check my full disclaimer. It's the time of the year when everyone starts sharing their favourite products, tried and tested throughout the year. I have been waiting for some good light to take some photos for a few weeks now, and alas, we are four days away from 2014 and I gave in - instead I will be sharing my favourites of 2013 in 'wish list' type posts. First up, skincare. A few of these have been reviewed on the blog before, some I have raved and raved about, and a couple will be reviewed in full in 2014 - so keep your eyes peeled! Here are the five skincare products which stood out for me the most in 2013. Clarins Gentle Exfoliator Brightening Toner (Escentual, 125ml, £22.85): The rather popular Clarins Gentle Exfoliator Brightening Toner was quite the skincare revelation for me in 2013. Completely changing the way I looked at exfoliation, this delightfully scented lotion is gentle and actually feels soothing when applied. It has key ingredients of White Dead Nettle, which is an astringent and contains healing properties, and Tamarin, which is loved for it's refreshing effect when used on the skin, leaving the skin revitalised whilst also repairing and healing. My skin loved this from first use; it smells lovely, very fresh and clean, and after just one use I could feel my skin improving. This effortlessly gives me smoother, softer and supple skin that is bright and refreshed. It's wonderful, I couldn't be without it. Kiehl's Midnight Recovery Eye (Space NK, 15ml, £24.50): I've raved about this quite a lot lately, so sorry for the overload - but it really is an unbeatable product for me. Squalane (pronounced 'skwa-lane') is a key ingredient, which effortlessly absorbs into the skin. Then there's Butcher's Broom, Evening Primrose and Lavender, all of which are adored for their hydrating, calming and soothing properties. Once applied, my delicate under eye area is soothed and cooled instantly, it's refreshing and calming. My skin feels more hydrated and supple as soon as I apply, and overnight it works to replenish, rejuvenate and refresh my eyes by morning. It's a miracle in a tube. Bit pricey, but one tube lasted me nine months (which works out at 9p a use), so I think it's an investment well made. Cosmedix Purity Clean (Medico Beauty, 100ml, £27.45): Cosmedix is a fairly new brand to me, introduced by Samsara Skin when I went for my facial (post to come soon) I actually have a couple of Cosmedix products now and I am smitten with each, but Purity Clean was the first I tried for myself at home and invested in. A concentrated, exfoliating cleanser, it has a distinct scent of cooling Peppermint Essential Oil, calming Lavender and Clarifying Tea Tree Oil. It's job is to penetrate deeply into your skin, eliminating any cellular debris, de-congesting pores and also as an added bonus, hydrating the skin too. This has been a pretty amazing product for me and I'm sharing a full review soon, so I won't go into too much detail here - but boy am I smitten. Balance Me Rose Otto Face Oil* (Look Fantastic*, 30ml, £32): This is a newbie in my regime, which I've been using daily morning and night for around five weeks now. My skin was in love from first use and I've never tried an oil quite like it before. With a signature blend of Pure Rose Otto, Palma Rose and Rose Geranium, this smells absolutely incredible; not overpowering, just right. Each of these essential oils stimulates cell production and revives moisture levels. There's also anti-oxidant rich Artic Cloudberry, Abyssinian and Rosehip Oils, all working to plump and smooth, while Cucumber, Aot and Starflower Oils calm and soothe. It feels lovely, it smells lovely and it fulfills all promises. My skin is oily and dehydrated, which can be an awkward skin type to manage. The Balance Me Rose Otto Face Oil, which is a late 2013 release, is absolutely wonderful and instantly hydrates my skin, plumping and smoothing. Easily a must-have for the winter months ahead when our skin will take a battering. Full review to come soon! Nuxe Nuxellence Jeunesse (Escentual, 50ml, £46): Oh, how I love this serum. I have around a third of mine left, stashed away for special use, rationing it until I can justify a repurchase. It's pricey, worth the investment, but still an indulgent buy that I just can't justify right now. An amazing serum, easily the best I have ever used which has left my skin so happy (and sad when I'm not using it!) It's a very science-y based product, so I'll let you read my full review for all the technical stuff; in a nutshell it softens, smooths, firms and protects the skin. My skin feels incredible whenever I use this serum, like fairy-tale perfect skin. Nothing makes my skin feel as plump and soft as this does and it works a really fantastic base for makeup. I can't compare it to any other serum; for me it's completely stand out, the crème de la crème. *This post contains a PR sample. For more information, please check my full disclaimer. Back at the very beginning of December, I attended a secret event with Weight Watchers at the Cookery School just off of Oxford Street, to find out all about the brand new plan which will be greeting members new and old in 2014. I'm a Weight Watchers member myself and so the invitation was pretty exciting. I didn't even know Weight Watchers had been planning to change up the plan in 2014, so I was really excited to find out all about the new plan and see how much had changed from my beloved propoints. Before the event I knew very little about the new plan, so everything on the night was actually quite the educational experience - I learnt so much, not just about Weight Watchers but food in general. Plus, there was a little surprise to come later in the night in the form of the new Celebrity Chef Ambassador! When I arrived I was greeted with a lovely glass of bubbles and offered some delicious canapes and little bites of incredible looking food. Little did we know as we all eagerly tried the different yummy options on offer, that these would be the basis of the evening ahead. Once we'd all indulged and started to get to know one another, we were gathered around to begin learning all about the new plan. The new plan is wonderfully named Simple Start, and it's really a perfect way to describe the plan because it really is an incredibly simple plan to follow. 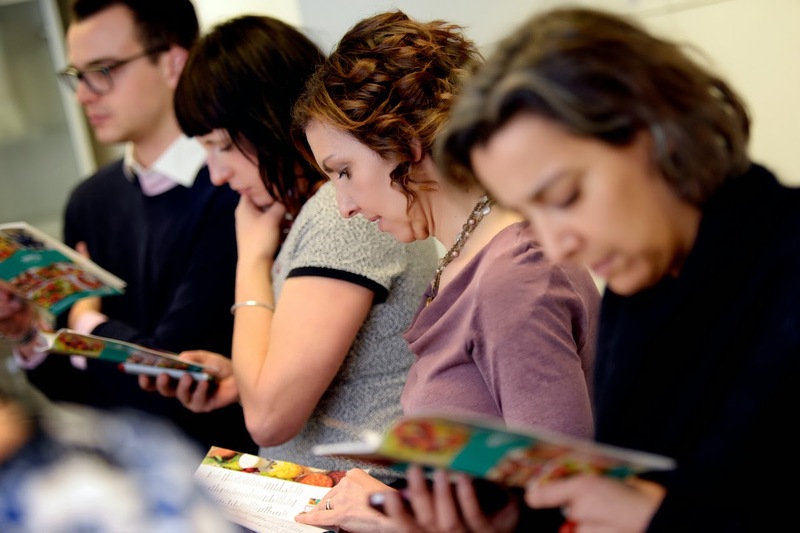 The idea for Simple Start came from listening to Weight Watchers members who had voiced concerns that the propoints plan was too hard to get to grips with. 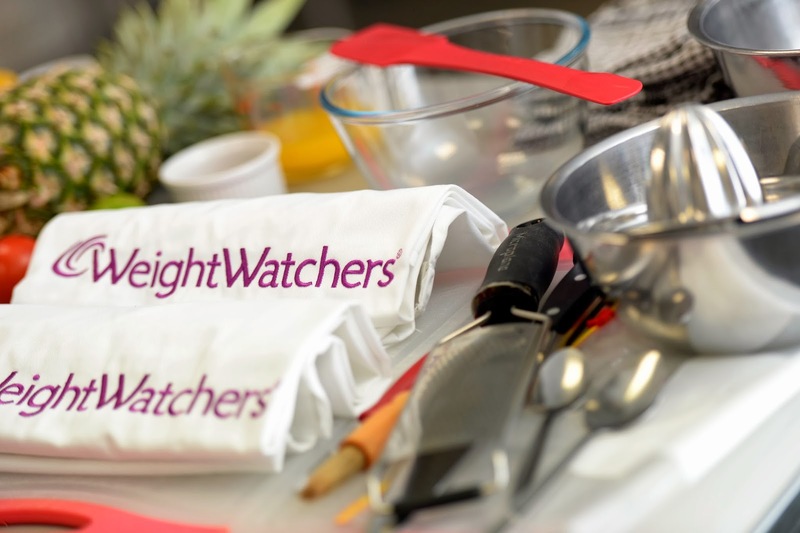 To make Weight Watchers both easier and quicker to get to grips with, Weight Watchers have created the new plan to help people achieve their goals without any overloading of information. It's a simple start to reaching your goals in a healthy way. So how does Simple Start work? A straightforward and easy to follow plan, Simple Start provides you with a healthy, filling, wholesome list of foods, all of which are basic proproints foods. There's also spices and herbs, general seasoning, which are referred to as Flavour Boosters, which you can use as much as you need of! Simple Start tells you which foods are great for your body and weight loss and which we should eat often to fulfill our bodies needs, as well as which won't be so good and might be best as a treat. You don't have to worry about propoints, all you start with is a list of foods and drinks, along with some incredible recipes and meal ideas, and your ready to go! You can choose any of the foods from the basic Filling and Healthy list, and eat them at any time of the day, whenever you want! Then, if you fancy a snack or a late-night treat if you're anything like me, then you have a list of Extra Treats, which lets you use two 'treat points' a day to indulge in extras for meals or sweet and indulgent treats. Simple Start requires no weighing or measuring, there's no restrictions - just stick to the food lists provided. Now, I'm sure there's a few of you, who like me will be thinking to yourselves, "But how can I lose weight if I eat everything I want?". Well, that's the beauty of Weight Watchers, of all the plans they've had past and present, Weight Watchers doesn't stop you eating a single thing nor does it tell you you must avoid some foods or you must eat others. It's all about eating in moderation and to help you get there, the Filling and Healthy food list is full of fruit and veg which is good for your body, and still tasty to eat. If you want something naughty? Have it, but use your two treats to have it! Eat what you crave, but in moderation you can have those treats whilst still losing weight. I don't know about you, but that's a pretty good way for me to lose weight! There's too many things I couldn't live without. After a couple of weeks on Simple Star Filling and Healthy list, you have two options - also really easy to get to grips with. Option One: By sticking to the foods on the Filling and Healthy food list, you've now learnt which foods are recommended as great for protein and all other nutrients you'll be used to. Then, by sticking to two treats a day from the Extra Treats list, you've seen you can indulge and have what you want, but in moderation. Option One allows you to stick to this method of eating and losing weight, but instead of two Extra Treats a day, you are given weekly allowance of 49 propoints. Don't get scared at the mention of propoints - by this point you've already been using propoints, you just didn't realise it. All the foods on the food lists, have propoints values, you see. Sneaky Weight Watchers! You can use your weekly allowance for any treats off of the entire propoints food list. You can use all in one day, or spread out over the week! Option Two: The second option after you've got to grips with Simple Start for a few weeks, is taking the final step over to propoints and eating by daily and weekly propoints allowances. This might sound scary, but I personally adore propoints and yes, it can take a few days to get your head around but once you know the basics, you're ready to go and it'll come so easily. For me, my weight gain throughout my life has largely been due to portion sizes and my complete lack of portion control. Propoints allows me to eat whatever I like, but teaches me how to do so in moderation and in a healthier way for my body. If you decide to go with option two your leader will calculate a daily propoints allowance. This is based on several different factors including your age, height, current weight, level of daily activity. This daily allowance is to be used on each day, and if you don't use up all your points you lose them - you can't save them for the next day. That's where the weekly allowance comes in again - this you can use any time, any day - it's literally like a piggy bank for treats! The difference between switching completely over to propoints is that you will need to weigh your food and in some instances, use the super easy Weight Watchers propoints calculator to work out points by inputting a few bits of info from the nutritional information. I actually enjoy weighing my food and working out the points - it's definitely made me realise where I used to overeat! After Simple Start have been explained to us, we were ready to start our cooking lesson! As we arrived, the new Weight Watchers Food Ambassador was announced; the lovely Shelina Permalloo, chef, book author and winner of Masterchef. Shelina was absolutely lovely and incredibly down to earth. She introduced herself, telling us a little bit about her background (which was handy for me who doesn't watch TV), before introducing some of her brand new recipes specifically made for Simple Start. 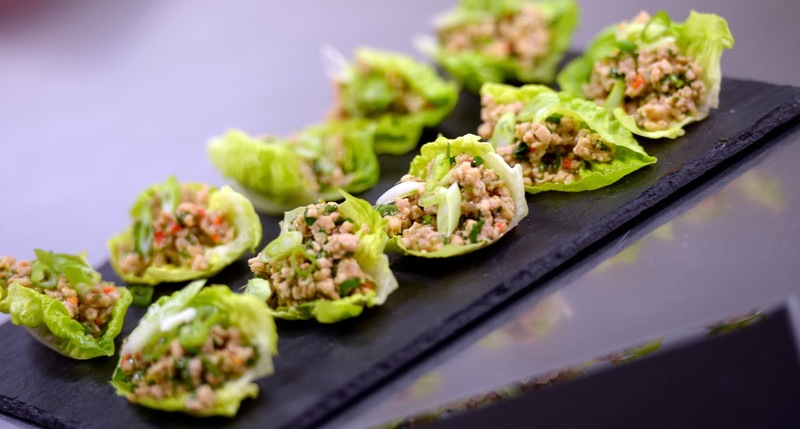 All those delicious nibbles and canapes we had at the beginning of the evening were Shelina's recipes, all recipes for the Simple Start plan that you can make at home yourself. Getting to eat wonderful, delicious food and it still be good for you? Yes please! 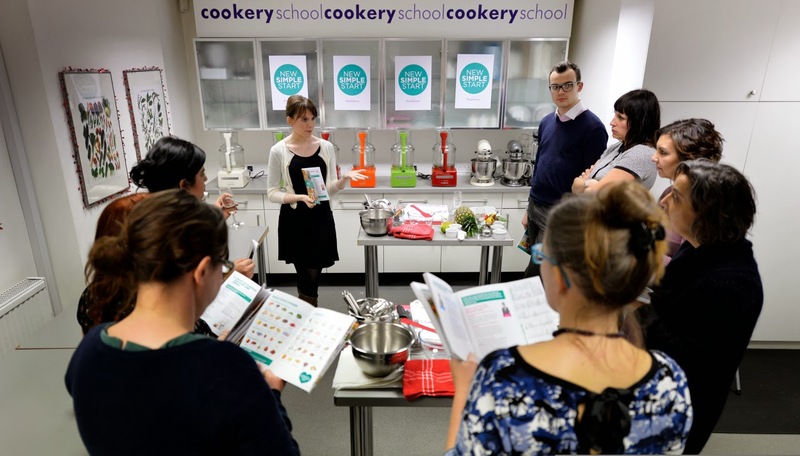 Shelina talked us through a recipe we would be creating with help from her and the fab Cookery School team. 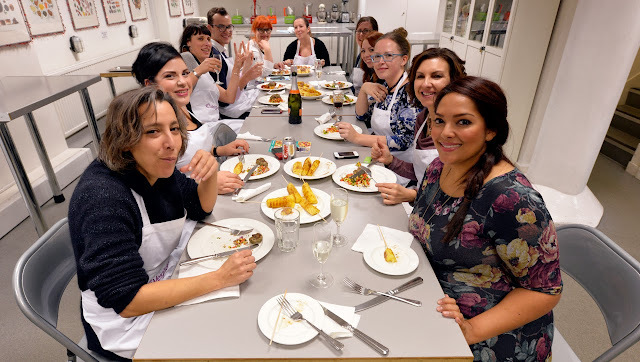 Working in pairs, we each had our own work stations with the exact ingredients we needed to create our Simple Start main course, including fresh pineapple, herbs and seasoning, turkey mince meat and corn on the cob as well as a whole other host of lovely ingredients! Our task was to make turkey patties with blackened sweetcorn salsa, with a side (or a dessert) of beautifully seasoned pineapple cooked to perfection. It really was delicious, and I plan on recreating the recipe at home myself soon - so keep an eye out and I'll try and get a full recipe up to share with you all! After learning about Simple Start, meeting Shelina and learning all about the tasty recipes she has created, as well as how really easy the Simple Start plan is, I would definitely say it's worth giving a go if you've been thinking of joining. For me, Weight Watchers isn't a diet. It's a decision to make a positive and healthy lifestyle change and make the right decisions now, to benefit you in later life. Weight Watchers allows you to lose weight and reach any goals you have, whilst enjoying the food you are eating. Simple Start is the start of a journey, but a journey filled with delicious food which teaches you how to enjoy food in moderation. As a member myself I know how daunting it can be to join Weight Watchers and go to that first meeting, not knowing anyone. But all of the Weight Watchers leaders and the whole Weight Watchers team in general are super lovely and welcoming, and members of meetings just as lovely. All of the ladies in my weekly meetings I see as friends, not strangers - we're all in this together. I have a wonderful leader, and I really do believe I wouldn't be able to get where I want to be, without my leader and my weekly meetings. Signing up is also really easy, you can do it online or in the meeting. There's a full list of meetings, where they are held, on what days and at what times on the Find a Meeting tool. You can find out more about Simple Start here, and if you'd like to join Weight Watchers yourself, you can find out more here. From January 1st I plan to do a fortnight on Simple Start, and I'll be sure to do a post letting you all know how I got on following the Simple Start plan! *I attended this event as a guest of Weight Watchers. I have not been compensated for writing this post. For more information, please check my full disclaimer.